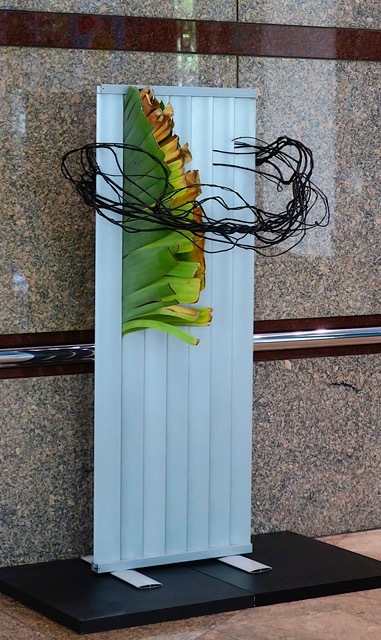 As I mentioned in my last post, our Ikebana International group held an exhibition in the Bourke Place Foyer last week. The photograph, above, is of my exhibit. I used aluminium louvres, to which I attached 'feet' for stability. I used two large strelitzia nicolai leaves, just as they were changing colour and wisteria vines, that I coloured black. I included the small picture with me in it to indicate scale. For photographs of the rest of the exhibition please go to Ikebana International Melbourne and click on Blog. My garden suffered a major disaster 10 days ago. Our magnificent, mature weeping willow fell. The trunk, which was growing at an angle, started to split after some particularly windy weather two days earlier. On the day in question, I was watching it as it continued to split and fall forward making very scary noises. Three quarters of the tree fell into our driveway, whilst the remainder was still standing. However, we didn't know how safe the standing portion was, so we called SES to come and secure it until we could engage a tree lopper to take care of it. Initially, we were going to have it removed completely, which would have left a large gap in my garden. But, thanks to an understanding and accommodating tree lopper, we were able to retain quite a lot of it, with thick branches jutting out of the garden like a giant spider. We are hoping that despite the partial split in the trunk, it will continue to grow. The photo, below, shows what it looks like now. 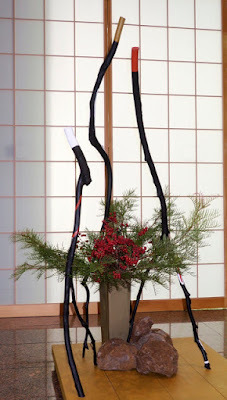 Of course, this was an ikebana opportunity not to be missed. So the senior students were asked to workshop willow. I leave you with this tall arrangement (1.3m), in which I used the left over stem from the strelitzia nicolai, that I used in my exhibition piece. The white belladonna created a natural mass to contrast the lines and added a delightful fragrance. It is devastating to lose a tree from your yard and I’m glad you were able to save part of it. In our front yard we had a beautiful 60-year-old tree with a hanging canopy of branches but in 1991 our city had a major ice storm and the tree lost around 50% of its branches. All night long I heard the branches crack and land with a thud on the ground. What an awful night! With much loving care over the next few years the tree survived and I hope your tree will also. I like your arrangement for the I.I. exhibition using vertical blinds.